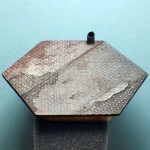 This sci-fi / steampunk themed hexagon-shaped miniature base is patterned with distressed diamond plate sections with rust and oil, as well as a rusted pipe. Got a cybertroll with his combat bike or a clockwork dragon to display? This 3.25 inch diameter and 0.75 inch (to the top of the pipe) display is raised off the table by a finished Red Oak hexagon base. This piece of yew is cut across four branches creating a really cool pattern. 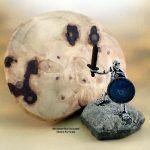 Imagine what your halfling adventure party would look like on this 3 inch, 2.75 inch wide by a quarter inch thick base (76mm x 70mm x 6mm). This Norway spruce is sprinkled with burls. 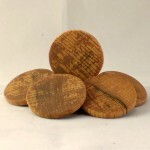 At 2.75 inches by 2.25 inches and a quarter-inch thick (70mm x 57mm x 6mm) this piece is perfect for a large humanoid, like a minotaur or gnoll. 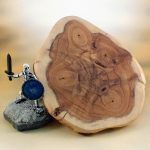 This round piece of black locust was sliced from a burl. 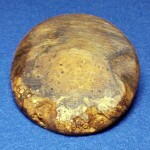 Two-thirds of the outside edges are smooth and the remainder are the burls rough outer nodules. At 2.5 inches around it’s a sizable base for an army unit (64mm round by 16mm). It would look awesome under a gnarled troll or some other gruesome retch.